I wore my wedding dress on November 3rd of 2016 at the Power Crosley Estate in Sarasota, Florida. When I was little I saw pictures of a wedding at the Crosley and I absolutely fell in love with the idea of being married there. The estate was built in the 1920’s and is right next to what is now the John & Mable Ringling Museum of Art. The Crosleys and the Ringlings (of Ringling circus) were good friends and settled in Sarasota on the bay where I was born, raised, and met my now husband! We both grew up on the water and couldn’t imagine getting married anywhere else. Knowing the building was styled in the 20’s I wanted my dress to match. I went to The Perfect Dress in Sarasota by recommendation of a friend and quite literally fell in love with the first dress that I saw. It was in the window as if it was waiting for me. I went back with my family and let them all pick out a dress to try on, but I saved my pick for last! As soon as I walked out of the dressing room everyone agreed that it was clearly ‘the one’! It is the Alvina dress by Kitty Chen Couture. It was truly the perfect dress for the perfect day! Kim’s wedding dress preservation will help preserve her treasured gown for a future daughter to wear. Kim and new husband fit right in the art deco styled mansion. A little moonlight Kim’s wedding celebration. Kim’s lace train extends beyond the satin below it. 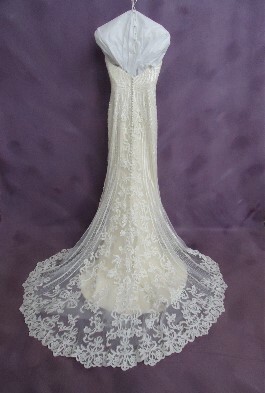 Champagne Kittychen Couture satin sheath wedding dress with detailed ivory lace overlay and train had a severely dirty hemline with several loose and missing beads on it when it arrived to our shop. And like many lace or tulle gowns, there were also a couple of small holes in the tulle hemline. There were also some loose buttons as well. We gave Kim’s hemline a chemical pre-treatment and extensive wedding dress cleaning. We were able to remove the dirt stains in the hem and the bodice. We also secured the loose buttons on her gown. Kim’s wedding dress is now ready for the next bride to wear. It has been preserved with Museum Method™ wedding dress preservation, a hanging wedding gown preservation so Kim can admire her wedding gown any time she desires. After the thorough cleaning, it is covered in an acid-free, cotton twill wedding dress preservation bag. 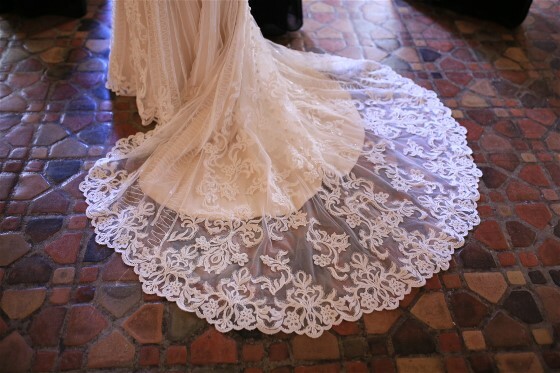 Get a Wedding Dress Preservation Quote for your heirloom gown. 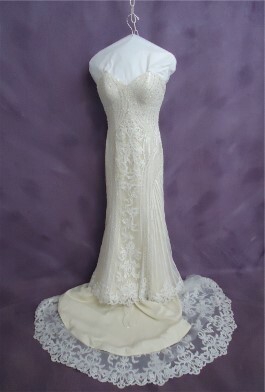 Kim’s Kittychen Couture wedding dress preservation to help protect it from yellowing. Hanging wedding dress preservation helps protect gown from permanent creases.